The basic belief in the Catholic Church when it comes to popes is that they are chosen by the Holy Spirit at a particular time and for a particular reason, and that the cardinals in conclave are merely the instrument to reveal that choice. Don’t take my word for it, ask any Anglican. They have been keeping their eyes on popes since 1534. Now, popes are human and there have been a few bad ones, the Medici crowd being an example. But, in spite of illegitimate children, poisonings, self-serving wars, and the occasional dumping of a papal corpse into the Tiber by dissatisfied politicos, when it comes to basic Doctrinal teachings, even the bad ones were not all that screwed up. So when Paul Ryan, who has a habit of announcing his politics are based on his Catholic faith as he screws the poor while favoring the rich, refers to Pope Francis as “the guy”, the disrespect in that reveals a bit of a problem between his declared devotion to his church and his expedient declaring of it. This pope is becoming popular because he seems to be moving away from all the bling that has been traditional at the Vatican, and speaking for the poor and mingling with them as well. He explained that the major problem with trickle-down economics is that as the liquid gets closer to the rim of the glass and is ready to spill over, the greedy simply exchange the glass for a larger one. It is not just a matter of people profiting from the work of others and increasing their wealth, but one of greed where the gap between the rich and poor is widening, especially in the United States. But if someone calls himself a devout Catholic, that person cannot question the pope or claim he is the wrong choice, the Holy Spirit having messed up, or they are going against the very beliefs that their devotion should be accepting. They are conveniently devout. They will use their religion as a crutch to justify what they do, but will find fault with it when what they do is obviously wrong and goes against church teaching. Ryan likes to label himself a compassionate conservative who wants his party to pay attention to the poor. He likes to point out that Pope Francis is his moral role model by saying such things as, “What I love about the pope is he is triggering the exact kind of dialogue we ought to be having. People need to get involved in their communities to make a difference, to fix problems soul to soul". But when it became obvious that the Pope did not agree with Ryan’s interpretation of being compassionate toward the poor, his arrogance and dismissiveness showed. “The guy is from Argentina, they haven’t had real capitalism in Argentina. They have crony capitalism in Argentina. They don’t have a true free enterprise system". The pope became just “that guy”. And then there is that devout Catholic and Republican donor, Billionaire Home Depot founder Ken Langone. He not only disagreed with the pope when it came to income disparity, but he leveled a veiled threat when he warned that wealthy people might end their charitable contributions if the pope doesn’t stop criticizing capitalism and income inequality. In classic transference of blame, Mr. Langone claimed that the papal comments on the exclusionary nature of prosperity and the lack of any trickling down to the poor would be the reason rich guys like him would stop feeling compassion for the poor rather than their greed being, well just that, greed. “Look what you made me do!”. Langone is leading an effort to raise money to restore St. Patrick’s Cathedral in Manhattan, so he is in a position to warn New York’s Cardinal Dolan that he might need to talk to the pope, or the money might just not be there to fix the place up. “I’ve told the cardinal, ‘Your Eminence, this is one more hurdle I hope we don’t have to deal with”, he said. “You want to be careful about generalities. Rich people in one country don’t act the same as rich people in another country". In response Cardinal Dolan said, “The Pope loves poor people. He also loves rich people.’ … So I said, ‘Ken, thanks for bringing it to my attention. We’ve gotta correct to make sure this gentleman understands the Holy Father’s message properly.’ And then I think he’s gonna say, ‘Oh, OK. If that’s the case, count me in for St. Patrick’s Cathedral". God is the pope’s boss; the pope is the cardinal’s. Seems this devout catholic wants to be both their bosses and is using an extortion approach to establish that. There is something so medieval about this. I guess Ryan and Langone forgot that thing Jesus said about not being able to serve God and mammon. Let’s hope the cardinal and the pope remember the words. And what was it that this Marxist (Limbaugh), left-leaning (Pallin), doesn’t know as much about religion as the Duck Dynasty guy and shouldn’t be allowed to exercise his freedom of speech when it comes to religion and the Bible (according to those who jumped at defending Phil Robertson and his take on religion, bur are silent on the attacks in this case) pope said? “Some people continue to defend trickle-down theories which assume that economic growth, encouraged by a free market, will inevitably succeed in bringing about greater justice and inclusiveness in the world. This opinion, which has never been confirmed by the facts, expresses a crude and naïve trust in the goodness of those wielding economic power and in the sacralized workings of the prevailing economic system. Not to share one’s wealth with the poor is to steal from them and to take away their livelihood". 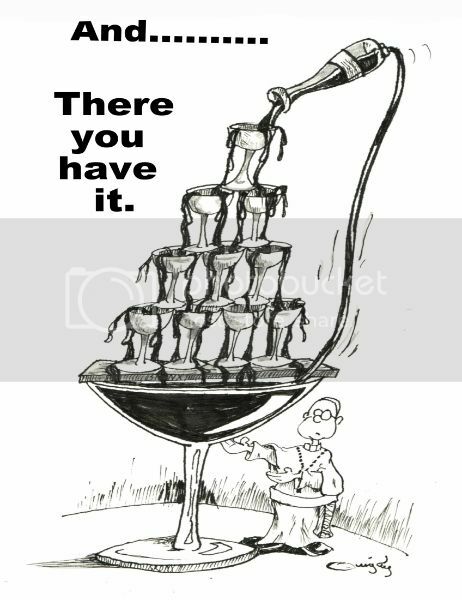 Trickle-down’s “promise was that when the glass was full, it would overflow, benefiting the poor. But what happens instead, is that when the glass is full, it magically gets bigger nothing ever comes out for the poor".